Well, I don't know what to call this thing. 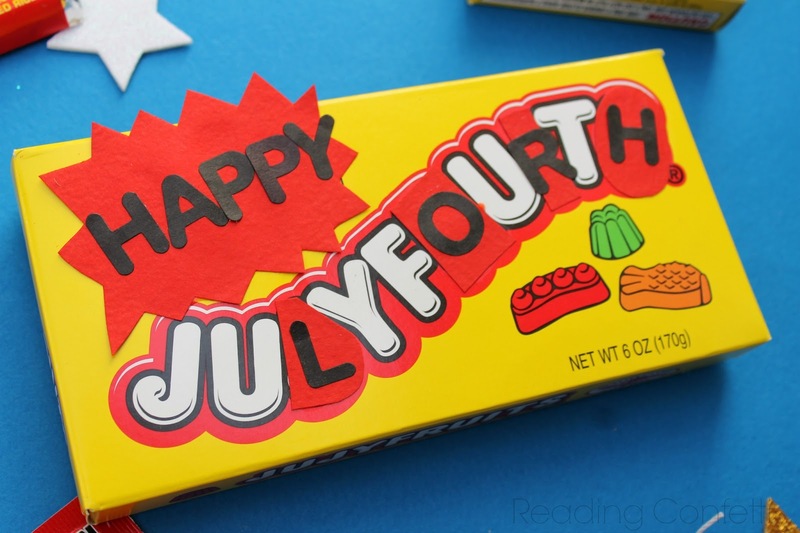 Candygram? Party favor? Card? What would you call it? 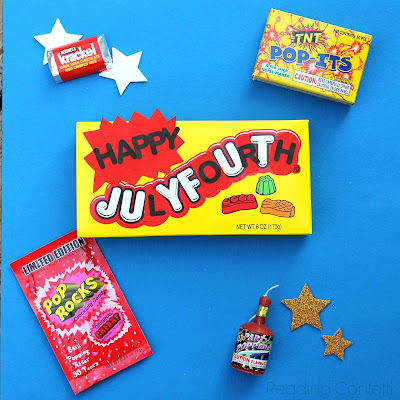 It's little treats with a 4th of July theme arranged on paper. Whatever you call it, it's cute to give to kids for the 4th of July and it's super easy and inexpensive to make too. 1. Cut red paper to fit over the letters "J", "R", "I", and "S" and glue them down. White glue works great. 2. Replace the covered letters with letter stickers or permanent marker. You'll need "L", "O", "R", and "H". 3. Cut out a firework shape and put the word "Happy" on it. Glue it to the top left corner. Use tape to attach your Jujyfruits to the center of your scrapbook paper and add some other 4th of July themed stuff. I was going for a snap, crackle, pop theme, but I had trouble with the "snap" part. Didn't those things kids throw at the sidewalk used to be called Snap-its? Well, now they're called Pop-Its. Or maybe they always were. Anyway, why don't they make a gum called "Snap"? 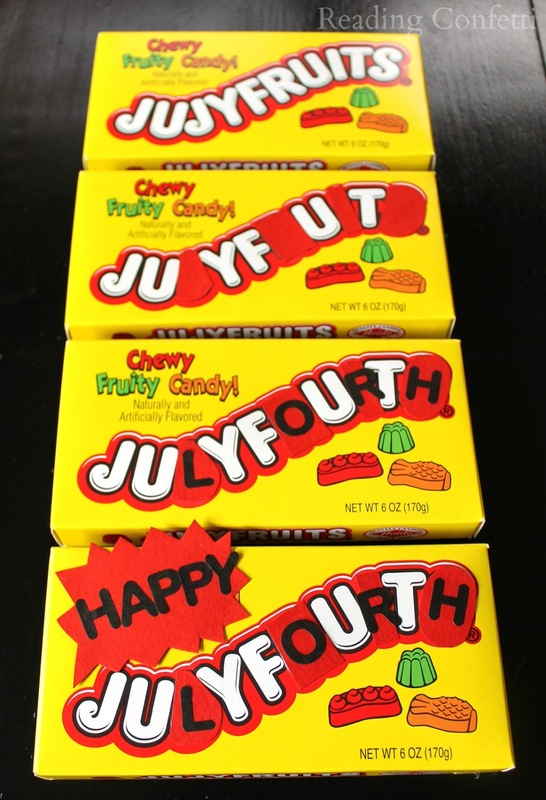 Arrange the rest of the goodies around your Jujyfruits and stick them down with tape. I found most of the candy I needed at the dollar store - the Jujyfruits, the Pop Rocks, and I even found a little bag of just Krackles at my dollar store, which I was insanely happy about. I thought I'd end up having to buy the big bag of Hershey's miniature bars and then eating all the other kinds of candy bars just because they were in the house and I have no will power. There you have it. 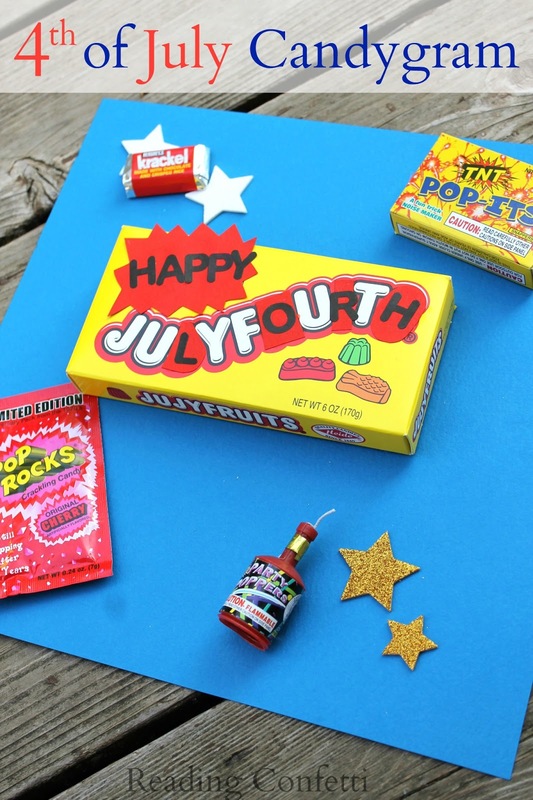 A cheap, fun 4th of July treat the kids will love.